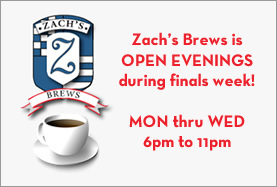 Home > Hours and Special Alerts > Zach’s Brews Open Evenings During Finals Week! Zach’s Brews Open Evenings During Finals Week! Zach’s Brews is open 6:00 to 11:00PM Monday through Wednesday the week of finals (December 4th through December 7th).